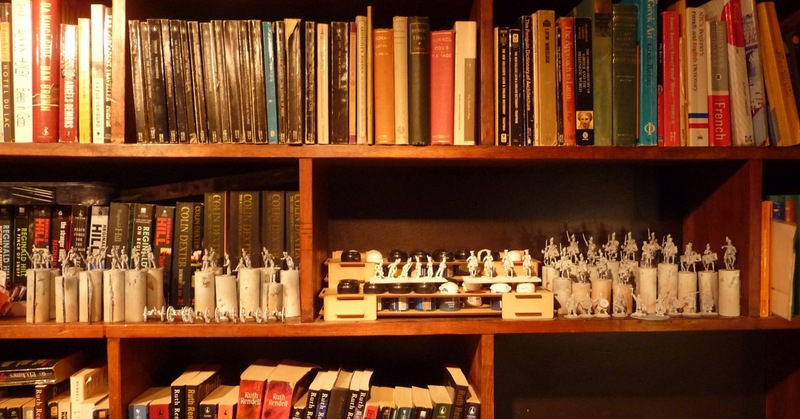 wargaming in 28 mm and sometimes smaller: The Contest and the Prediction! 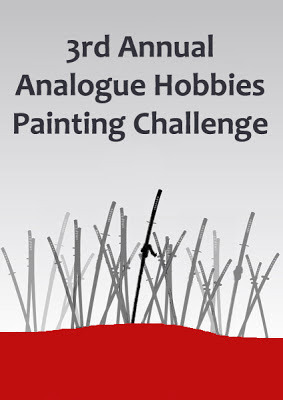 Well it is that time of year for the Winter Painting Challenge at Analogue Hobbies. This is the third of what I suspect will be an ongoing event, and I have been looking forward to it for a month or two now. This event appears to be becoming quite popular among the soldier men (that is what my wife calls us). The first event only had 6 entrants and was restricted to Napoleonics. I had completely forgot that I had actually won it with 134 points (I believe this would equate to 670 points in today's parlance). Last year there was 26 entrants and it was won by Crazy Ray (just look at his photo) with almost 5000 points. I came far down the lists at 1000 points. This year there is 47 contestants or Ronin as Curt has decided to call us. My two most excellent amis des jeux, Iannick and Nicolas have entered this year, I am looking forward to seeing what is on their lists. Well I have prepped some figures, as you can see they are mostly Brunswickers, with a few Saxons to complete my Dux Britanniarium army. 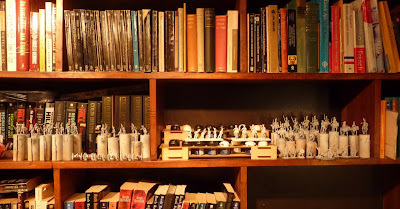 I use dowels to paint my figures so I could only prep so many figures, many are yet un-prepped. One really neat idea that Curt has put in place this year is to ask us to make a prediction of how many points we can get done between Dec 20 and Mar 20. Well I want to go for 1700 points, a 70% increase over last year. So a Somewhat Hopeful Prediction from Ronin #19 is as follows. Essentially I plan to get my two Dux armies done as well as a new 6 point SAGA Warband. I plan to get a great chunk of my Brunswick Corps completed as well as some miscellaneous Napoleonics to fill in some gaps. I also have my own cunning secret project in the works if Santa proves to be kind to me. ............well 9 days to go, I am working away on my son's LotR figures, so hopefully a few posts in the meantime. Good luck John! I'm looking forward to your Brunswickers especially as I've always been tempted to pick those up in the future. Good luck Sir! That's a fair amount of work you have planned and will probably put my meager offerings to shame, by comparison! Good luck with the challenge and hope you hit your target! I'm not sure what to prep as my mood is so fickle, but I do have some ideas. 1700 points is an ambitious target - bravo John. I know you can do it! Good luck with the Challenge John, I'll look forward to seeing more of them lovely naps! Wow! Looks like you're throwing down the gauntlet there, John! All the bestest with The Challenge John. I shall watch with much interest. Good Luck John, this is going to be a fun challenge to be a part of. Good luck John, I'll be watching the entries with great interest. Thank you gentleman, I sort of wish now that I went with 1500, but I suppose I will have to push myself. Bonne chance mon ami! That's quite a challenge! Congrats, I've awarded you a Liebster Blog award!